Nick: Aren’t Christmas All About Fun? Nick was an Orphan and he likes kids very much. When he was little, he was adopted by Maroni for the purpose of experimenting on the newly found Strengthen Steroid, which evidently turned him into a madman. But later recovered his sanity in an accident where boss saved him. Although he is no longer a madman, but the seed of madness still remains within him. Thanks to your help he has managed to escape from Maroni on various occasions; although you have trouble controlling him at times but you believe that deep down, he is a good hearted person. Thanks to his Strengthened body, Nick insight towards Bulker enhancement is on a whole new level; also due to his personality, made tends to following him willingly. ★★★★★Reach 5 Star & Lead Ops To Increase [Ops Capacity By 15000]; max level can increase! Strong & Invincible! 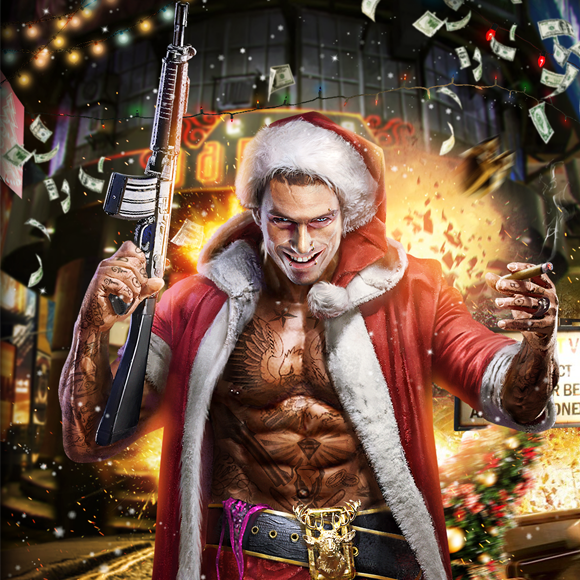 Just Purchase the “Wicked Saint Nick Pack” to unlock Vigilante Nick! This Is An Introduction From Caesar !! Obtain A Golden [Street King] Vigilante Set With Just 1 Pack! The MFA Girl Group Dress-Up Has Been Released!